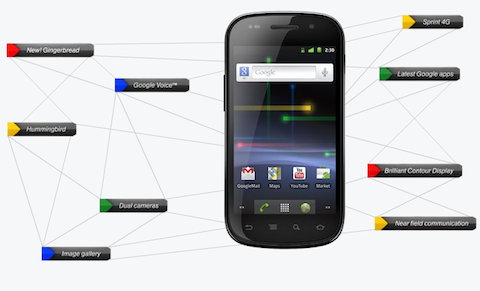 The Nexus S has been around for a while now, but not on CDMA networks. That is until now, the phone is making its 4G debut on Sprint. The Nexus S, manufactured by Samsung, is the “first pure Google 4G device with Android 2.3 in the U.S.”. The “pureness” of this device is not what makes it spectacular. You’ve got Sprint’s 4G network, NFC technology, 16GB internal memory, and a 5-megapixel camera. It is hard to describe the power that this phone has until you have it in your own hands. The Super AMOLED display makes for premium viewing. The Nexus S 4G will be available this Spring for $199.99 on contract. Hit the jump for the full press release. OVERLAND PARK, Kan. (BUSINESS WIRE), March 21, 2011 – Sprint (NYSE: S) extends its 4G device innovation lead once again with the upcoming availability of the 20th4G device and fourth 4G phone, Nexus S™ 4G1 from Google™. Coming to Sprint this spring, it will also be able to take advantage of the unprecedented controls and services enabled by Google Voice™ integration built into the Sprint Network. It is designed with Samsung’s brilliant Super AMOLED™ touchscreen technology providing a premium viewing experience. The 4-inch Contour Display features a curved design for a more comfortable look and feel in the user’s hand or along the side of the face. It also offers a screen that is bright with higher color contrast, meaning colors are incredibly vibrant and text is crisp at any size and produces less glare than on other smartphone displays when outdoors, so videos, pictures and games look their best and the sun won’t wash them out. “We’re excited to partner with Sprint on Nexus S 4G, which brings innovative hardware by Samsung and innovations on the Android platform, to create a powerful smartphone experience,” said Andy Rubin, vice president of Engineering at Google.